Paolo Presi was born in Gorizia (North-East of Italy) in 1947. Interested in Parapsychology since 1960 and in Instrumental Transcommunication (ITC) since 1973. From 1980 to 1982 he collaborated with “Gli Arcani”, an Italian magazine specializing in Parapsychology and relevant phenomena, as the person responsible for the EVP (phenomenon known in Italy as Psychophony or Metaphony) page. “Luce e Ombra”, the oldest Parapsychology Journal existing in Italy, publishing without interruptions in quarterly issues since 1900. “ITC Journal” the most prestigious international Journal dealing with research in ITC, founded and directed by Anabela Cardoso (Portugal). In 1979 he was one of the Founder Members of the Italian Association for Psychophony Studies (Associazione Italiana per lo Studio della Psicofonia- A.I.S.P.) and a member of its Scientific Committee. For his research activities in 1982 he was awarded Honorary Membership of the Institute for Parapsychological Studies (Istituto Studi Parapsicologici - I.S.P.) of Florence. Graduated as Engineer in Aeronautics. Having a technical background, he bases his researches, whenever feasible and practicable, on the scientific method. After a long survey of the EVP phenomena produced by many operators, his efforts have been directed to finding out the phenomenal constants and variables which characterise the phenomena. As a result of his investigations he has concluded that the technical devices used in the experiments are not a determining factor in EVP processes either from a qualitative or quantitative point of view, and that the phenomena do not follow the well-established physical laws. He has also concluded that the psychological conditions existing in the experimenter are fundamental for the production of phenomena whose qualitative results are strictly dependent on the level of mediumship existing in the experimenter. Since 1979, the year A.I.S.P. was founded, he has participated in several congresses, both in Italy and abroad (Germany, Brazil, Mexico, Belgium) reporting his research and, at the same time, getting into touch with other researchers and experimenters, establishing with them friendly relationships and information exchanges. In 1997 he was assigned a research scholarship, promoted by Mrs. Silvana Pagnotta, for a report on the current status of ITC research and its possible future development. The report was published in the Italian Parapsychological Journal “Luce e Ombra”-no.1-year 99°- January-March 1999. Since 1999 he has been a member of I.T.C.P. - Instrumental Transcommunication Platform - an international research organisation co-ordinated by Dr. Adrian Klein (Israel). 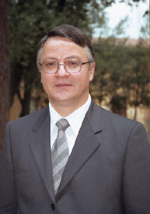 He is one of the Founder Members and a Member of the Board of Directors of the “Il Laboratorio” – Interdisciplinary Laboratory for the Biopsychocybernetic Research. This is an Italian Research Association, founded in Bologna in 2002, dedicated to the scientific and technical research into paranormal phenomena. Within the organisation he is responsible for the “Transcommunication Department”. With Daniele Gullà and Michele Dinicastro he manages an International Programme for researching into the possible electroacoustical anomalies characterising paranormal voices. This investigation currently uses the most sophisticated professional software for voice electroacoustical analyses. For his thirty-year research activity in ITC, the Swiss Association for Parapsychology has conferred on him the Swiss Prize for 2002. "La Parapsicologia e i suoi fenomeni"
"Verso la Scienza dello Spirito"
2nd Congress of A.I.S.P. - Arezzo, 1980. 5th International Workshop on Faith and Science for Psychical Research - Abano Terme 1998"
2° Congreso Internacional de Transcomunicacion Instrumental en Mexico – Toluca, 2000.